1st of all what is Yixing clay? 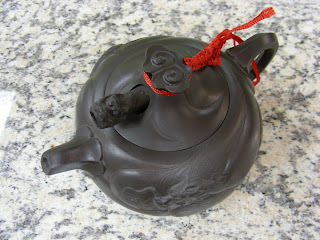 2, how does a clay teapot impact tea? 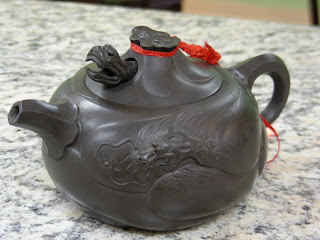 3, how tea impact the clay hence improves tea itself - why raise a clay teapot? 4, how to raise a clay pot? 1st topic: what is yixing clay? Soft clay discovered between rocky layers of mountains in Yixing region. 3 main types of clay: purple, green/yellow, red. All have high content of iron. Soft clays are left in open fields for months and years to be dried and corroded natural. Corrosion is to break up large chunks of clay into small pieces for further break down. Grinding pebble size clays into small grain size sandy clay, then soak in water for a days or even years to "ferment", the longer the better. 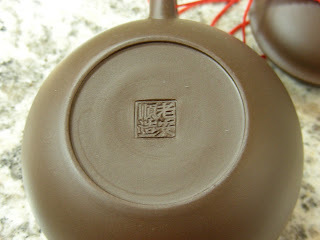 Depending on the need and finishing texture of teaware, various size of sandy clay are used for wanted results. Sifter is used to sift therefore group similar size sandy clays before using. Number of "eyes" is number of holes of the sifter per square inch, ie 40, 80, 120 eyes, the larger the number, the finer grains they are. Pot makers mix large grains of actual sands for texture and color contrast in appearance. By theory, large grains of clay and/or mixed with sands produce more porous teapots. Purple is most common, medium porous, green/yellow is most porous, red is the least. Purple clay varies in color by firing temperature, "fermentation" and contents of clay from different rock layers. 2 pieces of exact fermentation from the exact same batch, 1 fired at 1120 degrees is more brownish purple, the other fired at 1150 is darker brown purple, at 1200 degrees the color is a lustrous dark chocolate purple with higher pitch in sound. Purple is a general concept only. Green clay is earthy green in color before firing, becomes earthy yellow after high fire. "Little Red Clay" is similar to Zhu Ni but from 2 different mountains, Zhu Ni is no longer available for mining. 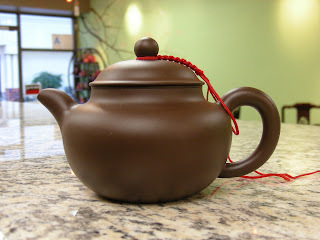 Both red clays make beautiful pot and tea, even though Zhu Ni is the most sought after due to rarity for 2 main reasons. It's no longer available on earth and pots made with such clay has low success rate in finishing products. 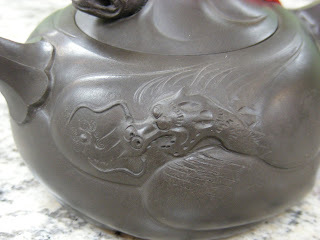 25% shrinkage after high fire made it difficult to have perfect shaped teapots, not to mention cracked defects or imcomplete products. Pot makers were and are reluctant to make them. This does not mean Zhu Ni must be better than Xiao Hong Ni in brewing tea. 1 of 2 most famous pot making families in the Chao Zhou region is Zhang's 章氏. 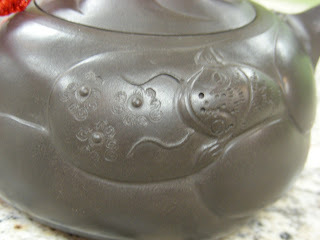 Zhang Yan Ming teapots can be found easily, some are collectible items. Beautiful hand made pots, but takes longer to raise. 100 sessions of tea drinking should do the trick. If 3 sessions in a day, 3 days drying after 3 days usage, which will take about 2 months of drinking and polishing to give it a luster shine and great flavor. Lao An Shun is a brand name owned and made by the father. Rumor has it that pots he made 20 some years ago was so thin and well balance, it won't tip over placing over water with lid on, floats like a boat. I have not tried it with this pot, but tempting. When drinking tea, my mood is usually at peace, or slightly happy, some times even a little dreamy especially alone. When I truly enjoy a seating of tea, relaxation and the calming effect are what I want to achieve most of the time. Once in a while tea makes me think about life. Some one once said there are only 2 things we human live and long for: pride and love. Of course that's after we are fed and clothed. Eat better, dress better, live in a bigger house, drive a faster car makes us proud (not necessary happier). Drinking good tea is prideful to a tea connoisseur. Yeah, you know you are, don't deny it! Finding good tea is some what like love, you hear it, you see others own it, and you may even have a taste. Can love between a man and a woman be more like an affair of a tea leaf and water, selflessly devote all that they have without reserve. Water contributes its pureness, its fluid liquid bodily texture, embracing each and every leaf. Leaves wholesomely give away its lively freshness taste, aroma, nutrient to water which allows it to dance and expand any way it wishes to. Tea, a concoction of love between a leaf and water in my cup. A love potion?! Human are selfish creatures. We want, we fear, we reserve. True love is a lot like rare tea, limited stock, except it's a lot rarer than rare tea. Kung Fu is known to many as martial art. Kung Fu tea therefore is related to martial art by default. Perhaps tea drank by martial art practitioners is called Kung Fu tea?! Perhaps tea must be drunk while making Kung Fu moves?! Kung in Kung Fu tea is different from Kung in Kung Fu in Chinese writing and meaning. Although both pronounce the same, they actually take on different meanings. An unclear subject in this part of the world far away from the region where clay pots were made: how to raise an Yixing pot? Contrary to common belief - soaking pots in tea over night to speed up the raising process, one shall rinse with hot water after finish using the pot then let dry in air. Another common belief is use the same pot continuously for a long period of time, on contrary, clay must be dried completely before absorbing new layers of tea oil. Use pot for 3 days and let dry for another 3 days before using again. It takes about 3 days for clay to dry completely inside and out, by inside, it is between the 2 out side surfaces of the wall.